Peter Wegner, Buildings Made of Sky (detail), 32 2004/2007, color photographs, 64 x 104". Of all the various architectural representations, it is perhaps the section view that presents the most edifying (as it were) image of a structure, revealing the space both inside and around it, the vertical ascension of its walls as well as their horizontal disposition and contiguity. Taking the section view—loosely conceived—as its point of departure and bringing together a range of related images, objects, and installations in various media, this exhibition remains true to the essence of the section cut: at once arbitrary and inclusive, a mere slice and a comprehensive view. Organized by Henry Urbach and drawn exclusively from the museum’s own holdings in architectural representation, the show offers a revealing “section” of SF MoMA’s collection, even in its humble dimensions. In their varied scope and scale, perhaps the most striking presence in the show are the works of Peter Wegner, an artist concerned with different phenomenological dimensions of space. 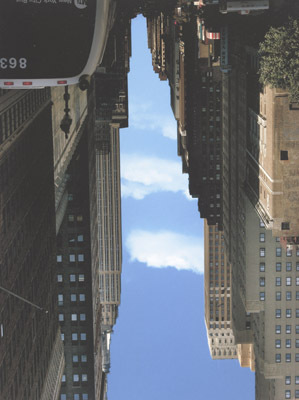 His multiphotograph panel Buildings Made of Sky, 2004/2007, turns a series of Manhattan cityscapes on its head, rendering the negative space between buildings the images’ unlikely protagonist. These serrated silhouettes—otherwise unremarkable but for Wegner’s photographic inversions—seem suddenly to haunt every and any city center. If these tableaux of an alternative city-in-reverse conjure up a more sweeping sense of urban (dis)orientation, his Guillotine of Light, Guillotine of Shade, 2007, turns the gallery’s space itself into a stage for more immediate spatial experience. This work cleaves two gallery rooms with a double-sided wall composed of millions of pieces of iridescent colored paper. Its “cut”—composed, in turn, of innumerable miniature slivers—thus also joins, for it magnetizes the empty space on both of its sides. The exhibition is anchored by a video and several photographs from Gordon Matta-Clark’s 1974 Splitting project, in which the artist sawed a New Jersey home in two—an act of cutting at once conceptually nuanced and absolutely literal. The inclusion of Mario Botta’s sections studies for SF MoMA’s building and Jim Jennings’s building sections for houses on nearby Lombard Street round out the exhibition nicely, infusing it with an endearing self-consciousness about its own spatial coordinates.